The denturist profession is pro-denture wearer, not anti-dentistry. Denturists are an educated part of the dental team. They learn their trade under highly qualified education guidelines. Before obtaining licensure they must pass a difficult written and practical examination specific to the profession. Through their careers they are required to continue their education in the denturist profession and remain up to date with new technologies specific to the profession. The lab technicians charged with fabricating dentures are not given access to the patients, as they are restricted from involvement in the clinical side. Dental assistants often write few directions regarding the details needed for manufacturing appropriately fitted oral prosthetics, and as a result patients are dissatisfied and dentures must be adjusted repeatedly. This inefficient and imperfect communication leaves lab technicians to create dentures essentially blindfolded. When you work with a denturist you see one professional from start to finish. This allows the patient to communicate their needs directly. Taking the patient’s health history and dental impressions also gives the denturist a good understanding of what each individual needs. This usually results in getting the right fit the first time. 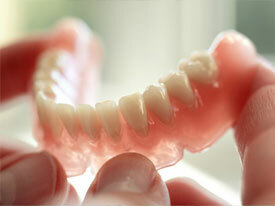 In this way denturists save their patients money by not requiring extra visits to correct imperfectly fitted dentures. According to a study conducted by the State of Michigan, states where denturists operate legally have a much lower cost for dentures. When denturists are allowed to provide dentures directly to the public they can do so for nearly half the price of a dentist.